This is a black and white snapshot of Antoinette (Toni) Ciccarelli sitting on a wooden fence in front of a teepee. Toni is sitting reclined with her body angled sideways and her legs crossed. She is smiling straight into the camera. Toni is wearing a two piece light coloured outfit: a short sleeve button top with a knee-length skirt and white strappy wedge sandals. 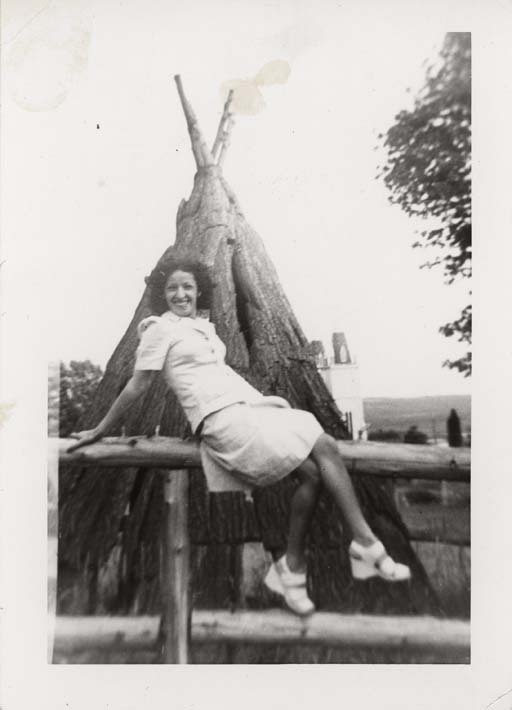 The background shows a field with trees and a building structure peeking from behind the teepee. A tree is shown cut off to the left side of the picture plane. There is a light brown staining throughout the photo: left side middle, top corner, and top center.